After a successful P2PVS I ran into a couple of problems: The RES Workspace Manager Service didn’t start and one of the key components of this image (an outlook plugin) gave a weird error that didn’t show up at first. I did some troubleshooting and found that the RES Software WM Service couldn’t start because the executable wasn’t found, I could browse to the directory and the res.exe was there. Luckily Barry Schiffer came up with the idea to check the shortnames which are used to start the RES WM Service and a lot of software still use the shortnames for the Office folder as well so apparently we had shortname issues with Citrix XenApp and Citrix PVS. Note: Even in 2012 some applications still rely on 8.3 names. Scanning the for commonly used director names (i.e. C:\PROGRA~1) can help revealing affected programs. After changing this value back to “0” we were able to run a successful P2PVS and the errors in RES Workspace Manager and the key application were gone. Here’s some background info on why to disable shortnames and how to check this from the command line. 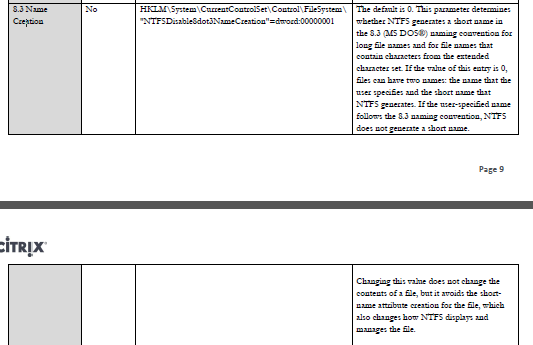 Kees, I checked the best practises doc from Citrix but the section about 8dot3 is not there anymore. I did however still encounter a problem with RES Workspace Manager 2014 after reverse imaging with xenconvert. So point is still valid, just set it to 0 is my opinion as well!